Cant give my Elite away! Posted a 2011 Elite on Ebay for a quick sale.... Are they that bad? Maybe I should mount it up and take ride on it. Seriously try Ski-It-Again and or CraigsList. What size? Ski-it-again is the way to go not Ebay. I'd be all over it if I didn't already have one as well. It should go fast at that price on SIA. It is on Ski-it-again but not for the quick sale like on e-bay. I think it is on ski-it-again or $700.00. I throw all kinds items that I collect here at the shop up on e-bay all the time. it gets me my fun Money! @jody seal what are you looking to get out of it if you posted it on ebay at 475? I might be interested in it for that price. Rode one last summer and really liked it but wanted to stay brand loyal and buy a strada. Your ski might make me change my mind. Well it is on e-bay for $475 plus shipping of $75.00. Then again Horton has three of them for $474.99 plus shipping.. You want it for what I have it on E-bay for it is yours let me know I will close the bidding on e-bay. I have 2 on SIA with a handful of inquiries. Seems like when Andy quit promoting them, the interest dried up from pure perception. The Elite really is a great ski. Well If we cant sell em we could pool them all together and make Adirondack chairs out of them. They would last longer then those silly old woodn ones. Jody, Might want to take another set of pictures. Yours on evilpay look wacked. Looks like I gave it away! well sold it for the E-bay price. It has a new owner. The proceeds will help fund my thunder down under in two weeks! I have a slightly stiff one that is NOT for sale. It is one of my all time favorite skis. I have one in each size. Basically new. If anyone wants one shoot me an email Priced to get out of my ski room. "I have a slightly stiff one that is NOT for sale. It is one of my all time favorite"
Had to read that twice. With the RTM process those skis should be as good as the day they were made. Why are so many people dumping them? Mike Erb Cedar Ridge Canton Miss. I flex tested both of mine. The 67 had 2 months and the 68 had a full season. Both were dead on the original numbers. Most people I know who have skied one said they just took big hit after big hit out of the bouy, and as MS notes, they were hurting their elbows and shoulders. 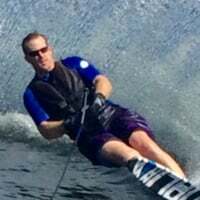 That being said, my son skis on an Elite and he keeps it moving like nothing I've ever seen -- it just rolls straight through from pre-turn to turn to hook up without ever slowing down. Suggests to me that it is perhaps somewhat ski style specific. Razors kid and Dawg are the only smooth people that I have seen on the elite. I would add Karen Stevens and a few others but overall not many. So, am I not smooth? I have never had bad elbows or shoulders!! Ugly knees, maybe. You are so mean and hurtful!! Oh, you mean smooth skiing. Never mind! That's why I am on a Fisher. You still mad?? My wife loves her 65.5. I have talked to her about trying a D3 this Spring, but at the moment she is hearing nothing of it. She was a buoy off her her PB of [email protected] this past summer, and she did that 3 kids ago! I am hoping the RTM durability is for real because it will be hard to get her off the Elite. Thager looks much better on the Fish but I am glad he bought my Elite from me.